This is not my first Mac, but it’s pretty close. The first Mac I ever used was a Mac Plus owned by the father of a friend. 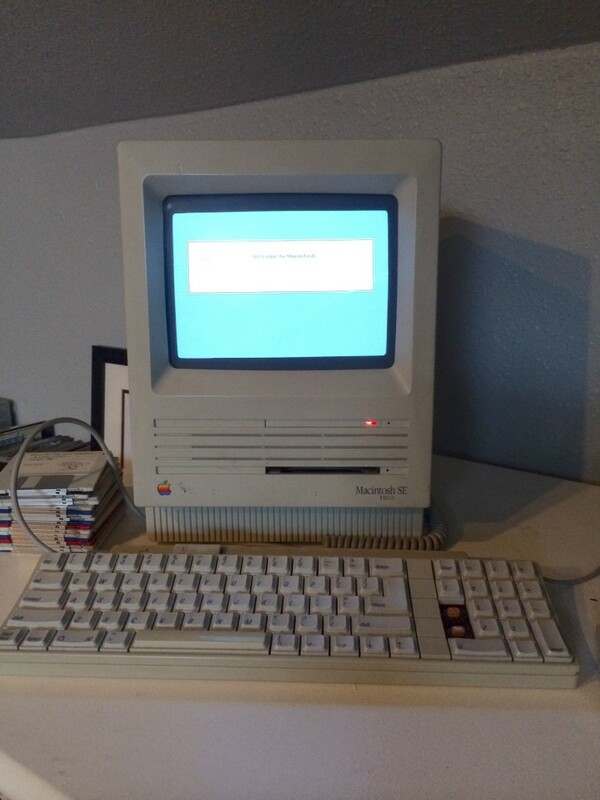 It didn’t take much time with it to convince me that a Mac would be my first computer. We played Hunt for the Red October and I won the game because I had just read the book and did exactly what Ramius did. It drove my friend who had spent hours on the game berserk. I stayed up late into the night playing Shufflepuck Cafe, Shadowgate, Oregon Trail, Scarab of Ra and one of my all-time favorites, Strategic Conquest. I also had a 1400 baud modem and got onto bulletin boards and GEnie, GE’s online service. I bought a book by Adam and Tonya Engst to figure out how to get online. I spent endless hours tinkering with After Dark because we took saving our screens seriously in the 1990s. Occasionally I even wrote a paper on it. I sold it in 1992 to buy a marked down LC. Color! Since then I’ve purchased a Quadra 610, a Performa 6400, a PowerBook 520c, a Power Mac G4, a blueberry iBook, two titanium PowerBooks, a white iBook, an aluminum PowerBook, an aluminum iMac, a MacBook Pro and a MacBook Air. The SE above I picked up off of eBay around 2000 for a dollar so I could replay some of those old games. The keyboard’s missing a couple of keys and the cable only makes a connection when you prop it in at a certain angle, but it works. Not bad for a 25-year-old computer. I’ve also bought or been given a number of other “vintage” Macs — a Mac Plus a friend found by the side of the road (still boots! ), a G3 PowerBook, a lime iMac and the first Intel Mac mini. There are 13 Macs of various eras in my office alone and three more in other parts of the house. I’ve seen enough of those hoarder shows to know that collecting old Macs is part hobby, part sickness. Why do I need a G3 PowerBook that won’t stay on for more than five minutes? I don’t. But perspective on the computer industry is important, too. You can’t appreciate where we are now without knowing where we’ve come from. So happy anniversary, Macintosh and here’s to many more. I’m still enjoying the ride. Possibly too much.